I love my Butternut Squash Soup with no Cream recipe, it is probably one of my most followed postings on my blog and it is by far the easiest most delicious recipe with so few ingredients. I stumbled upon this rendition and thought I’d play around with it and see if it was worth it to mess with a good thing. The soup itself has a few more veggies and garlic and chipotle chiles* in adobo. I love spicy so I wanted to see how this would be. 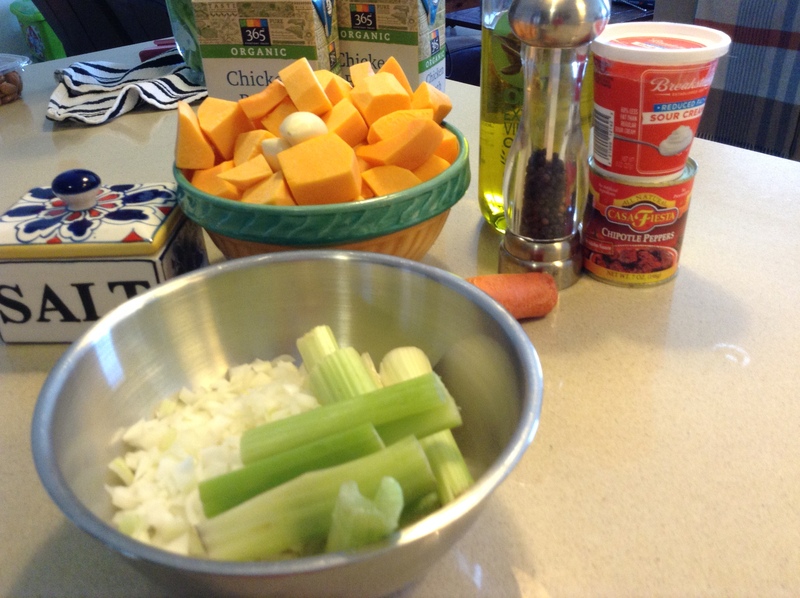 My original recipe is under Creamy Butternut Squash Soup no Cream and it was originally posted on October 18 2011. This was delicious, if you’ve always made the butternut squash soup the basic way this is a nice variation. This was pretty pretty good and really nice and creamy! The chipotle and the veggies and garlic give this variation a nice flavor. Give it a try. The sour cream topping is optional but pretty and tasty . We clearly love spicy but I didn’t think this was too spicy with the 2 teaspoons of chipotle. If you don’t like spicy this one’s probably not for you. I am a sucker for anything with chipotle in it. *chipotle chile is a smoked, dried jalapeno. They can be found dried, pickled or canned in “adobo” which is a sauce made with ground chiles, herbs, vinegar and spices. The sauce tends to be a bit milder than the chipotles themselves . 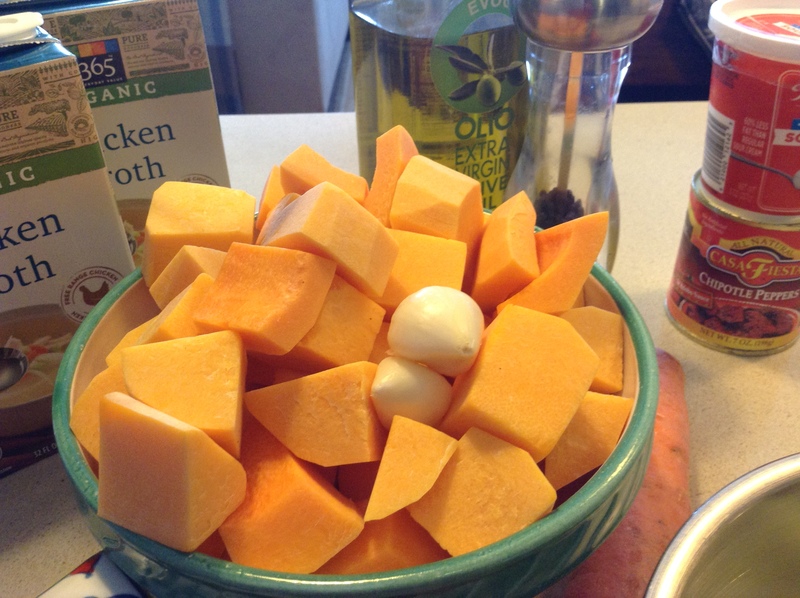 butternut squash , ( I bought 2 packages from Whole Foods of cut up butternut squash it was about 1 lb. each package) canned chipotle in adobo sauce, onion, celery and carrots. Sour Cream if you’d like to add to make topping. 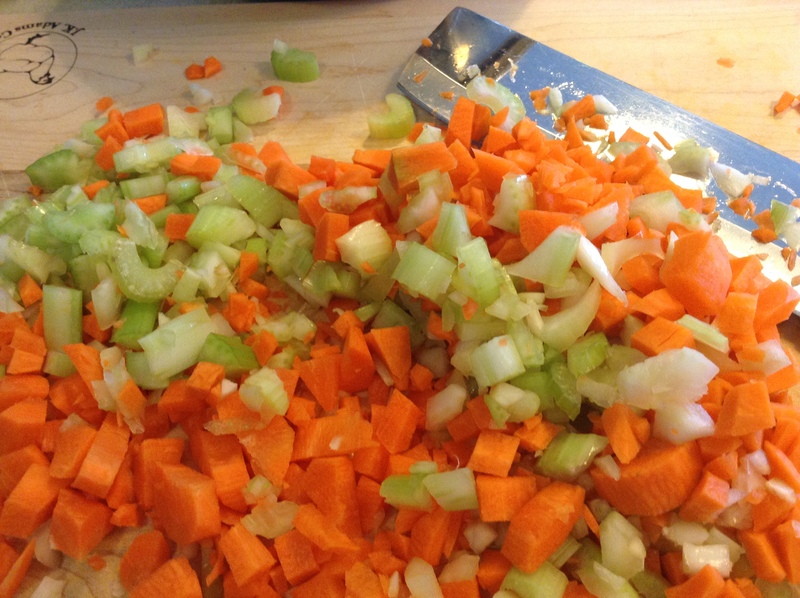 In a large heavy pot over medium-high heat add 2 Tablespoons of Olive Oil, heat olive oil and add the basic mirepoix ( carrots, onions and celery) and throw a good pinch of kosher salt in there, you’ll taste for salt later so don’t worry about amount. Saute veggies until tender, about 10 minutes. Add the garlic and sauté for another 2 minutes. 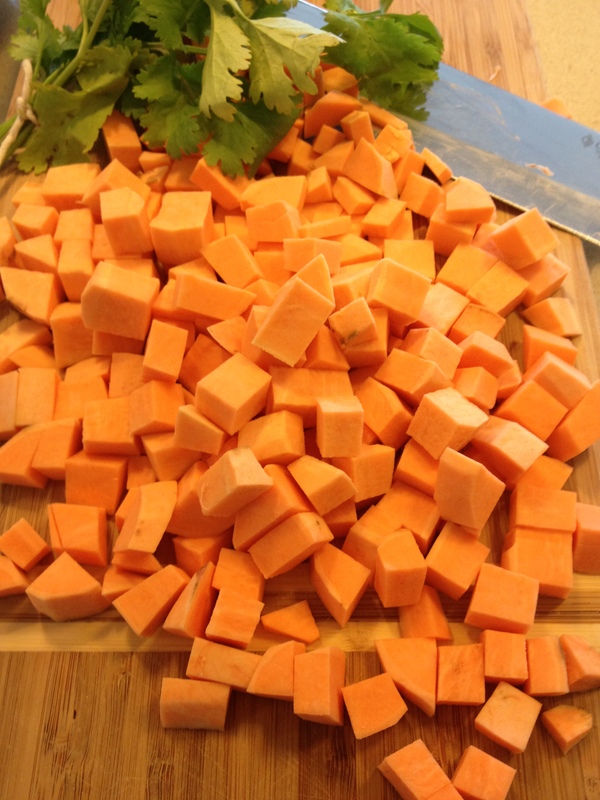 Add butternut squash cubes into the pot and stir. 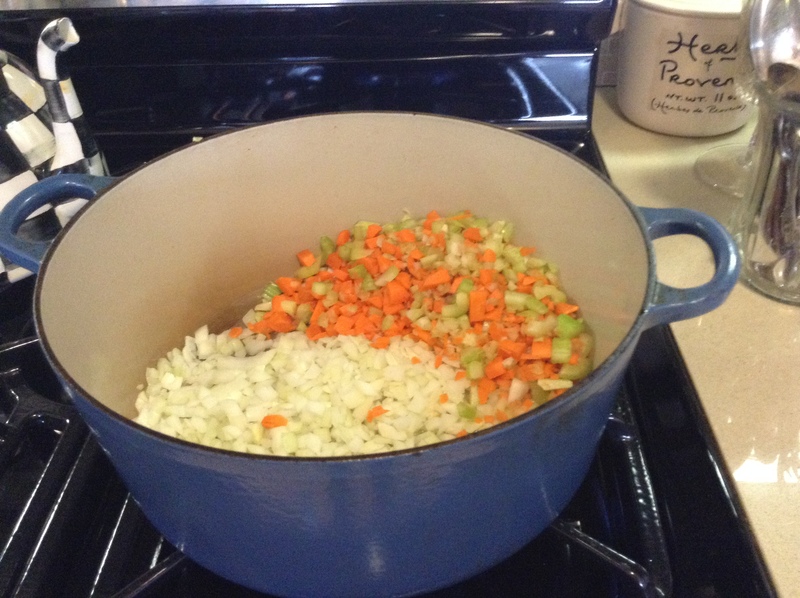 Add 4 cups of the chicken broth and bring to a boil. Reduce the heat to low, cover the pot and simmer the veggies are very tender, between 30 and 50 minutes. Turn off the heat and let soup cool for a bit. 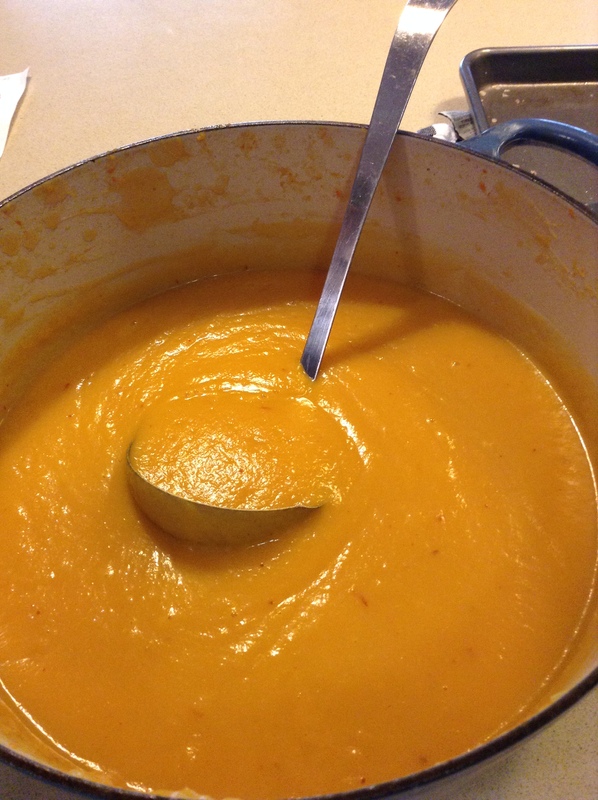 Then get out your immersion blender and carefully puree the soup until very smooth. If necessary, add more of the remaining stock till you achieve desired creamy consistency. Mix in the 2 teaspoons of the minced chipotle into the soup and continue to puree, season to taste with salt . If you’d like to make the sour cream topping , mix together 1 teaspoon of chipotle and the sour cream. Season the chipotle cream with a little kosher salt to taste. Transfer the soup to bowls and top off with a dollop of chipotle cream and serve! This entry was posted in soup and tagged Butternut Squash, Butternut Squash Soup with Chipotle Cream, Butternut with Chipotle Soup, Chipotle Chiles in Adobo, Chipotle Cream in Soup. Bookmark the permalink.